As always in Maryland Shakespeare Festival’s signature Bare Bard experiments, The Merchant of Venice is an exercise in impromptu Shakespeare. The cast of actors will arrive in Frederick on Friday evening with their lines already memorized, and by Saturday evening, they will perform the full production before an audience—with stunning emotional realism, audience interaction, live music, choreographed dances, and unbeatable storytelling. Let me explain: the actors met on Friday evening, had dinner, talked about the play, worked through some things on Saturday and then with no rehearsals, performed it for the first time on Saturday evening, in front of a live audience. They performed it once more on Sunday afternoon. And then the actors stayed for a bit afterward to discuss the play and answer questions. And now it’s done. History. Seriously, this was a pretty incredible experience. It is experimental theater, more in tune with the ways of Elizabethan theater, where plays were produced fast and furiously with little rehearsal and not much in the way of props or staging. Did I say props? Ummm, the only props I can remember in the entire production were the scales and knife that Shylock carried into the courtroom preparing to take his pound of flesh from Antonio. Oh, and the three boxes that Portia’s suitors must choose from to win her hand. Bare Bard, indeed! Did I mention Shylock? It was very interesting to see this so soon after watching the Playing Shakespeare episode devoted entirely to this character. Shylock was incredible here — played by British actor Stephen Lorne Williams, a Broadway veteran (and currently playing at the American Shakespeare Center in Staunton, Virginia which I posted about a few months ago). I found his Shylock filled with psychological angst from bearing a lifetime of racism. In the discussion after the play, people talked about anti-Semitism in the play, whether this reflected on Shakespeare himself, the times, or whether we cannot know. I have not re-read the play yet, but my feeling from this production was that Shylock’s pretty much psychotic insistence on having his pound of flesh rather than twice the payment he was due, was due to a lifetime of maltreatment and disrespect. He thought he had a moment of power after a lifetime of powerlessness. Even that backfired on him. Amazing. And then, of course, the play is a comedy, and the players made the most of many of the comic elements. I especially enjoyed the silliness regarding the errant rings at the end. And there was a great moment where Lorenzo sang to Jessica one of the Beatles’ love songs (I think it was “And I Love Her”). Very funny. Was it perfect? No, I mean how could it be when there have been no rehearsals. There were some requests for lines, but they were rare, considering. And I didn’t count them as flubs… there were really none. Shylock was definitely the high point of this production, but a lesser character caught my attention, too: Shylock’s servant, Launcelot Gobbo. His internal back and forth between conscience and the fiend… it was both funny and extremely insightful — the perfect role of the jester. I loved it. If you find yourself near Frederick, Maryland, I recommend that you check out the Maryland Shakespeare Festival. I posted about these folks during the summer outdoor freebie Shakespeare season. They are playing several Bare Bard experiments this season and it is an amazing way to experience Shakespeare. As well as raw and bare, it is also up close and personal: they play in the parish hall at an Episcopal Church. There is not even a stage. The actors were literally a couple feet away from me. Amazing! KR, Well done review of this excellent staging of Merchant of Venice. Thanks! It was really nice talking to you. Hope to see you again at another Bare Bard! Also, I wanted to tell you about Chesapeake Shakespeare Company in Ellicott City… you might like to take a little trip over there. They are doing Titus Andronicus in the haunted ruins of an antebellum finishing school! I saw them do Much Ado About Nothing last summer. It’s really nice… but I can only imagine what this production is like with all the blood and gore and following the actors around at night through the ruins! 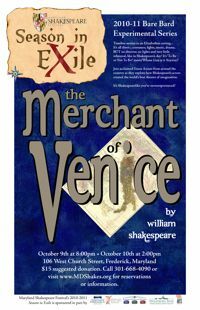 http://www.chesapeakeshakespeare.com/onstage.html (Or maybe you’ll want to wait for Hamlet in November!) Take care.